Another view of the blue ringed octopus! 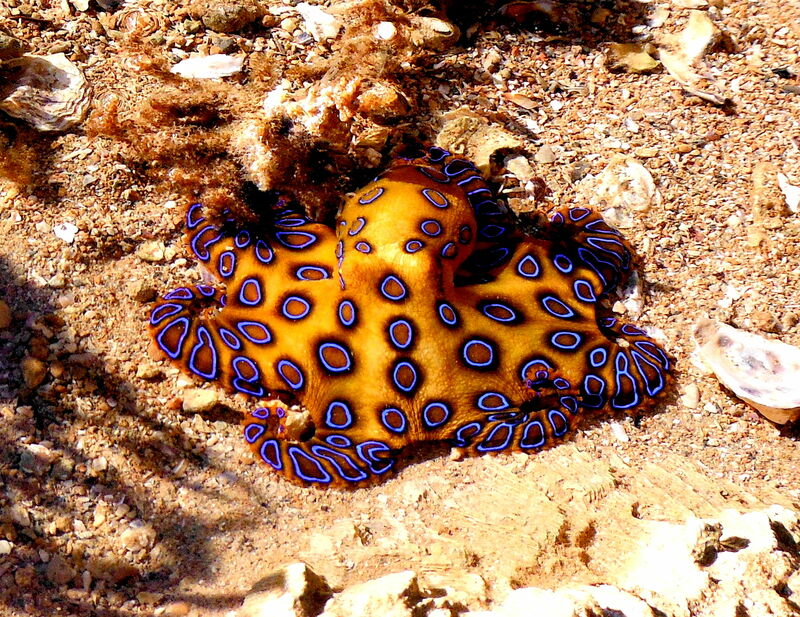 It is interesting to reflect after 5 months of blogging, with forays into art, poetry, music and architecture that my most popular post of all time is of a blue ringed octopus. Fantastic sunsets, wonderful objects d’art, fascinating travel memoirs…dross! Put up a picture of a deadly creature and people are sure to flock to your virtual blogging door. So here it is! The second photo of my blue ringed octopus encounter and I hope to see it also appeal to the worldwide audience that delights in the exotic and deadly! If you want to see an original you need to take a boat to a remote island off the coast of Western Australia and remember….NO TOUCHIE! Next Papa Bouilloire Chapter 8 and Bath! It looked like a scarf! It would certainly make you “drop dead gorgeous”! Dear little thing. I’m shure it would just lurve a big hug!